*Relative child poverty rate is the % of children living in households with equivalent income lower than 50% of the national median. Source: CICH Graphic using data adapted from UNICEF. Measuring Child Poverty, 2012. https://www.unicef-irc.org/publications/pdf/rc10_eng.pdf – accessed July 15, 2017. 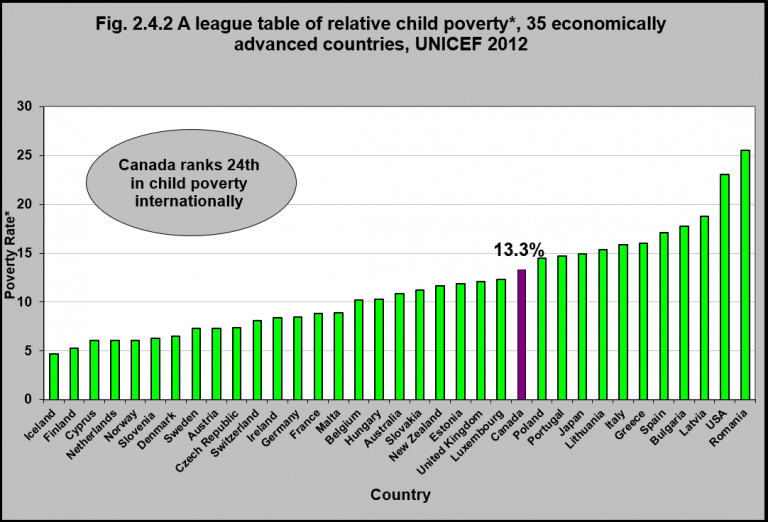 The U.S. has the second highest rate of child poverty. 1UNICEF. Measuring Child Poverty, 2012. https://www.unicef-irc.org/publications/pdf/rc10_eng.pdf– accessed July 15, 2017.